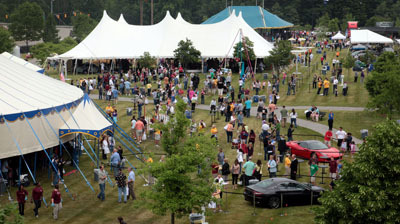 AUBURN HILLS, Mich., June 11, 2011 -- /FiestaPinata.com/ --At the Chrysler Technology Center (CTC) in Auburn Hills, Mich., 40,000 employees and their families gathered for Chrysler Family Day to commemorate its 2nd anniversary and the recent repayment of loans from the U.S. and Canadian governments. FiestaPinata.com, the Premiere Pinata Manufacturer of promotional pinata products, supplied a full-sized Fiat 500 sports car pinata for the event. Filled with over 75lbs of a variety of hard candies and suspended in the air just above the height of the average 12 year-old. Unlike the traditional pinata game where a bat is used to break open the pinata, a different, safer version on the game was played call the Pull-String Pinata Game. Hundreds of colored strings suspend down from the bottom of the Ginormous pinata with only one string opening the trapdoor underneath, releasing the candy. 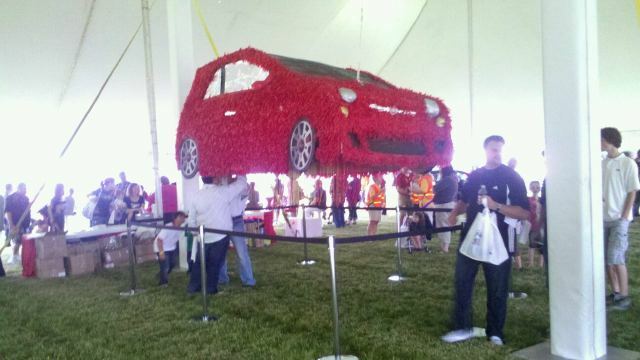 FiestaPinata.com was glad to see our pinata bringing so many smiles to the families of the Chrysler Family Day event. We hope to be a part of it again next year!